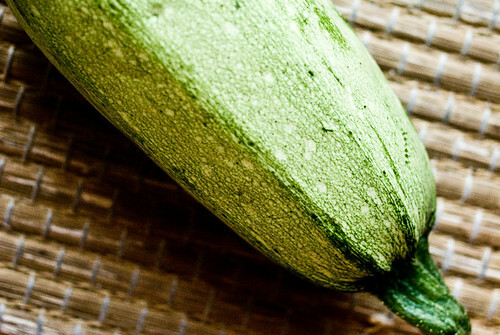 When a farmer hands you a beautiful fresh summer squash and tells you, “this is only the fifth zucchini I’ve picked so far this year,” you really want to do something nice with it. 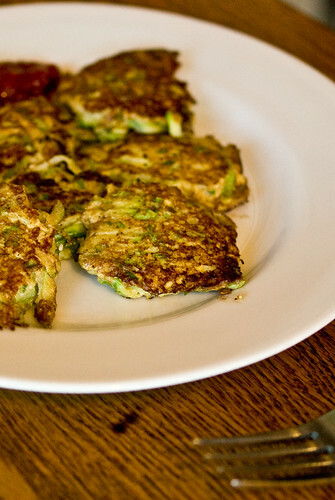 I made fritters. 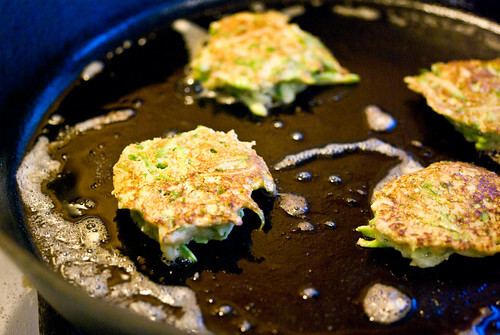 Zucchini fritters are something I used to make a lot, but it’s been a while and I can’t find my original recipe, which was from a low-carb book by Fran McCullough and seems to be lost in the mists of time. I made something up, based loosely on my memories and on a recipe in Vegetarian Cooking for Everyone , and a bowl of egg yolks in the fridge left over from my grandfather’s birthday cake. Next time I think I’ll actually follow a recipe, but this was still pretty yummy. 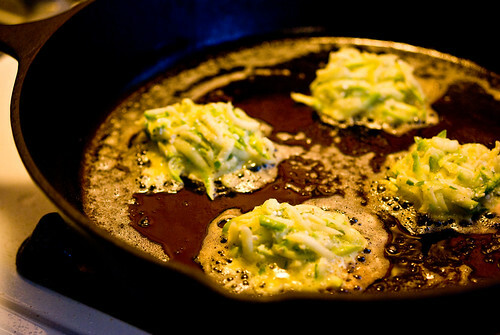 I grated the zucchini and pressed the water out (note to self: next time actually do the salt-and-let-stand-30-minutes thing first). I mixed in four egg yolks (because that was how many I had, not because it was the right amount), a handful of matzo meal, a bunch of fresh chopped parsley and mint from the garden, and salt and pepper. I dropped spoonfuls of the very loose batter into frothing butter in a cast iron skillet and cooked them until they turned prettily golden, turning carefully halfway through. We ate them for breakfast with a perky mix of ketchup and sambal badjak (a recent find at Ranch 99, very spicy and delicious). 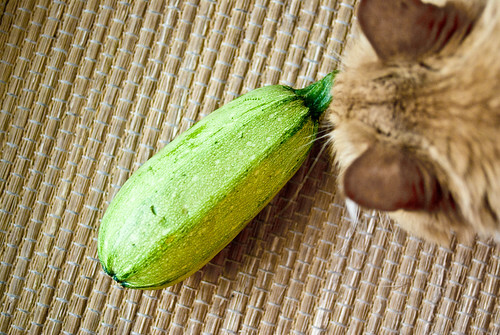 I’m already looking forward to my next zucchini of the season. 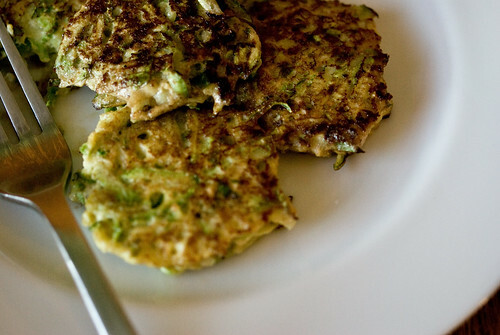 I make zucchini pancakes, I don’t even drain them but mix with egg,breadcrumbs, a little mayo, lime juice and fresh hot pepper, scallions salt and pepper. I usually serve it with chutney and sour cream. Yummy way for extra zucchs. That sounds excellent. I like the addition of lime juice.